Educators salaries are set to raise by 75% this year! Sorry. That is likely untrue. I just wanted to get your attention. Though I do hope your pay is commiserate with your duties, I will ask your forgiveness and indulgence for just a few more sentences. Just stick with me. Do you know the names of your students? I know the question is a bit odd. Of course you do, correct? The Britneys, the Ashleys, the Emilys… the Matthews, the Tylers, the Davids. I’ll bet you can’t even toss an eraser without hitting someone named Michael, eh? Then there are the last names. Smiths, Nguyens, Washingtons, etc. So, if you could change the names of your students, would you? Should you, and why? Though I am a person that likes to take the long view of everything, the curriculum of your local school district may not look favorably upon you reassigning titles, not to mention the ire of parents that perused baby-name books for months in search of the perfect moniker. Yikes! What I’m suggesting is that you change the names of your students for just one day. And doing so in a manner of what I term Stealth Teaching, or teaching without the kids necessarily knowing that they’re being taught. Sound tricky? Ohhhh, yes. Find some name labels (the kind that stick to clothing if possible), or you can use mailing labels, or even some type of tape (now we’re getting frugal) and tag your kids. 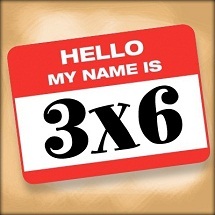 But instead of having the students write out their names, assign each a math equation, as in 3 x 6, or 40 – 7, or (depending upon the grade level) the square root of 49. Those students would then be (in order) 18, 33, and 7. Should you feel compelled to add to the confusion (oh heck, why not? ), you can assign an answer to each student (say, 12 or 365), at which point students would need to be addressed as potential questions, á la Jeopardy (what is 3 x 4, what is 10 + 2, or what is 400 – 35, how many days are there in a year?). Be prepared as this approach can have many solutions, but is a wonderfully creative approach. And you don’t need to stick with one the entire day. If it’s getting too easy, give everyone a new tag after lunch. You can also choose a day when your charges are geographically named (the capitol of Nebraska, the Southernmost continent, etc.) and so on. The list of topics is nearly inexhaustible, and you can ask your students if there exists a theme that they would like to visit one day, though I would personally discourage “names of popular video games” or “shoe stores at the mall.” LOL! Give it a try, and don’t forget to use your imagination. And if it were up to me, you’d get that 75% raise.